In January 2015, I made the decision to sell the c8, as it’s long focal length was making imaging with it on a mobile setup too difficult. 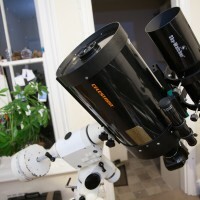 I’ll return to the joys of long-focal length imaging when I finally have a permanent observatory setup. Until then, I’ve made a decision to stick with the shorter refractors, which are much less demanding in the way of alignment and guiding. 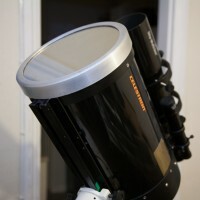 The C8 is an f/10 Shmidt-Cassegrain telescope made by Celestron. This particular model is slightly older, produced in the late 90s, with the previous generation coatings on the corrector plate. However, the difference is minimal, especially when using it for imaging. Shmidt-Cassegrain telescopes (SCTs) are an ingenious design that folds the light path up within the tube so the light reflects back and forth several times before exiting to the eyepiece or sensor. This means that the scope itself can be much shorter and lighter than the equivalent Newtonian telescope. The central obstruction caused by the secondary mirror cuts down the contrast ever so slightly, but the design results in a much smaller scope that is far better for imaging on a mount that is not huge (like my HEQ5). This scope is almost half the weight of my f/6 Newtonian, whistle delivering a similar aperture. The focal length of the scope makes it brilliant for imaging planets. With a 2.5x Barlow like I have, the focal length of 200omm gets increased to 5000mm (5 metres! ), so the magnification has the potential to be higher than with the newtonian, with a far more stable setup due to the decreased length. For deep sky, this scope gives much closer views than the Starwave ED102 refractor I use, so is much better for smaller objects where you need the magnification. However, at f/10, it’s a bit ‘slow’ optically for imaging – it would take a very long time to get any decent exposures. Therefore, for deep sky, I use a f6.3 focal reducer, which brings the focal ratio down to (funnily enough) f6/3. This means that, whilst the magnification may be less, the exposure required is much shorter too. The field of view is still much smaller than the refractor so the difference is still worthwhile. I have a Full Aperture solar filter for this scope, from Thousand Oaks. The second shot above shows the scope with this filter in place. Lastly, this scope is also a brilliant visual scope, which was part of the reason I went for it. I wanted a scope that would serve both imaging and visual purposes, and, I hope, will replace the Newtonian for both of these at longer focal lengths and larger apertures. Only time will tell if this is the right decision!